You're invited to participate in one of the top card games in the world. Click here to play! You'll need to keep a poker face while you're spinning in the right hands for a chance to bring in plenty of big pots! Faced cards are coveted while playing cards, as they will help you form the highest hand. It's the same in this game as Kings are the ultimate symbol. 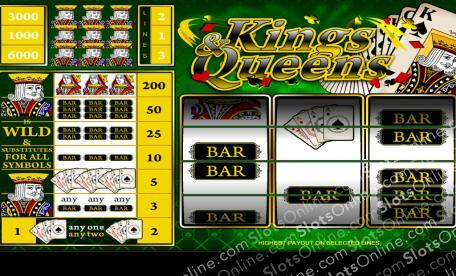 Spinning three Kings across line one will bring in 6000 credits. Three across line two brings in 3000 credits, and three across line one brings in 1000 credits! Queens are also pretty valuable in this card game. Three of them across an active pay line fetches 200 credits. Triple, double and single BARS also bring in plenty of credits, as does a hand of four Aces. There are also a few other combinations to help you boost your bankroll! So, take your seat at this exclusive card table and see if you can outplay everyone else to bring in plenty of big cash wins! The King acts as a wild and will replace all other symbols to help you create more wins.